From I-10 take exit 46A (I-I10) south approximately three miles. Take west exit on to Highway 90 for approximately one quarter mile. 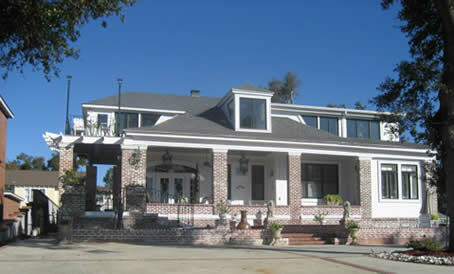 Chateau Blessey (1012 Beach Blvd) is on your right approximately one hundred yards east of the landmark Biloxi Lighthouse. To take the scenic route from the airport, go south on Hwy 49 approximately four miles to the intersection of Highway 90, go east approximately 12 miles. Chateau Blessey is approximately 100 yards east of Lighthouse. You must go one block east of Lighthouse and take next turning lane west to enter the driveway to 1012 Beach Boulevard, you will see a palm tree in front of a raised rose garden.